Add elegance to any living area of your home with this exotic yet comfortable "All Weather" barrel-shape collection. Made of handwoven soft vinyl/resin fibers crafted over an aluminum frame. Includes cushions in your choice of indoor/outdoor fabrics. Sunbrella fabrics available for an additional cost. Ocean Gray finish. 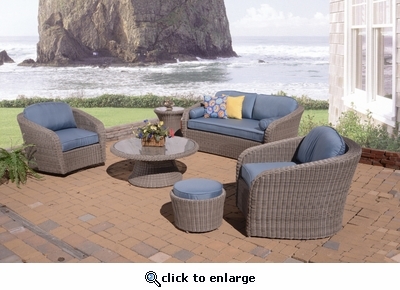 Set of Four includes Loveseat, Chair, Coffee Table, & End Table.